Sport Clubs are registered student organizations that provide a program of instruction, recreation, or competition in a specific sport. The Sport Clubs Program is part of the Department of Recreational Sports. Rec Sports provides oversight, resources, and support to each club. 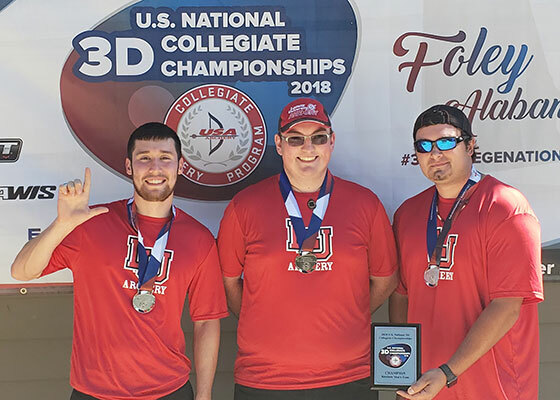 FOLEY, Alabama - The LU Collegiate Archers, an archery sport club sponsored by the department of Recreational Sports, won first place at the US National 3D Collegiate Championships on October 28. The LU men's barebow team of Cody Sahualla, Shawn Blair, and Jose Wong won first place, beating teams from 31 other universities from across the nation. Cody Sahualla, Club president and coach, won second place in men's individual barebow division, and Shawn Blair, club vice-president, won third place in men's barebow. Lamar University came in seventh place overall out of 31 schools and 335 archers. Sahualla said, "I feel we have all improved as a team, and would like to give honorable mentions to the rest of the teammates, to commend them for their great performance at Nationals. I have no doubt that they will be able to climb to the top for Lamar at our next competition." Other LU Collegiate Archers competing at Nationals included club treasurer Kylie Bradley, Maria Fernanda Munoz, Zoran Leadon, Dalton Outz, Brandon LaBarbera, and Sherry Banditrat. The US National 3D Collegiate Championships are sponsored by USA Archery, the national governing body for the Olympic sport of archery. USA Archery is recognized by the US Olympic Committee for the purpose of selecting and training men’s and women’s teams to represent the U.S. in the Olympic, Paralympic, and Pan American Games. For more information about Sport Clubs, call 409-880-7862 or email sportclubs@lamar.edu. Download our Visiting Club Packet for all necessary information when traveling to compete against Lamar Clubs.